Thank you for stopping by my Word-Filled Wednesday (WFW) and Thankful Thursday (TT) post, and the results of my First-Giveaway! For Word-Filled Wednesday, I like to share this encouraging verse from 1 John 5:11 with you. ♥ I am thankful to God for demonstrating His love for me by sending His only begotten Son, our Lord Jesus Christ, to die on the cross for me to redeem me from eternal damnation and to forgive me of my sin, reconcile me to Himself and give me eternal life. ♥ I am thankful to God for encouraging me through His Words daily, guiding me to walk in His ways, comforting me through all the trials and challenges in my life, and filling me with joy in believing in Him and His precious promises. ♥ I am thankful to God for blessing me with my family who love me. As I am the only Christian in my family, I do covet your prayers that God may in His time give me the joy of seeing my mother, sister and 2 brothers coming to know Him savingly. ♥ I am thankful to God for giving me a church who loves Christ and loves me. They have been a great support and encouragement to me as I strive to live for our Lord and serve Him. In all my afflictions and difficult struggles with clinical depression and bipolar disorder, they have demonstrated extraordinary love, kindness and support. Due to my health condition, I am doing some freelance work of selling my Homemade Bookmarks, Cards and Gifts and some freelance administrative work. The Lord in His faithfulness has been providing for me through the kind love gifts of some brethren in my church who gave cheerfully and anonymously as unto the Lord. Through these kind love gifts plus the income from my freelance works, all my needs have been met over the last 1 year. All praise and glory be to God! ♥ I am thankful to God that I can serve Him through this blog. It has been a great blessing for me to share my life and God's goodness to me, as well as some useful resources and articles with you. I have been greatly blessed by your kind comments especially in letting me know how the posts here have been helpful to you. Thank God and thank you! ♥ I am thankful to God for the prayers and encouragements of so many of you! It is my joy and privilege to meet all of you through blogging! I am greatly blessed and encouraged by many of you. Thank you for your friendships! I like to share the following blog award with all of you! ♥ I am thankful to God and to Willow and Jill of Forever n Ever n Always for sharing this sweet award with me and blogging friends. Jill created this award to share with us. She loves the Lord and is a great encourager to many of us who knows her by her encouraging posts and comments. Do visit Jill if you do not know her yet! I am glad to share this sweet award with you, my dear Readers and Blogging Friends. Do take this Award, post it on your blog and share it with your friends! This is what Jill said on her post and I say Amen to it! It expresses my thankfulness to God and appreciation of all of you and the way God has used you to bless my life! "... I gave out the award I designed to share with each of you who reads my blog and shares my passion for Christ! I am deeply thankful for the many friends I have met along this journey since entering blogland. Many of you have touched my heart and life in ways that have changed me eternally! I thank you for being a faithful servant and being obedient to the upward calling every time you share a piece of His heart living out in you! I pray that you will share this award with others who have touched your heart by sowing seeds of love into your life! 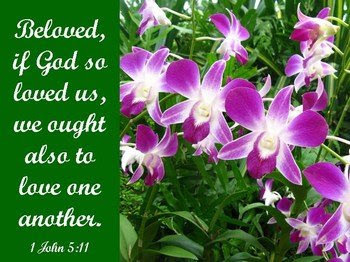 They will know we are His by how we love one another! Let us sow seeds of love throughout the blogging world and touch the hearts of those who come to read what we all share! To HIM be all the glory forever and ever! AMEN!" 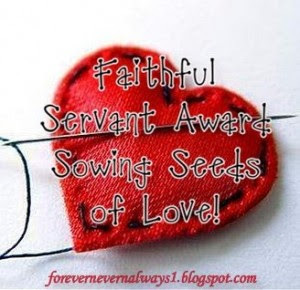 Please accept this sweet award and pass it on to all your dear friends who are faithfully sowing seeds of Christ's love through their lives and blog daily! All praise and glory be to God! ♥ I am thankful to God and to all of you who have kindly join in my First Give-away last Wednesday. I am greatly encouraged by your heartfelt participation, your many kind words of encouragements and the good suggestions that you have made! I am so overwhelmed by all your comments! I must confess that I am having a hard time deciding whom to give the bookmarks to! I have initially planned to give 5 or more of you the set of 6 bookmarks each. But as I read all your 40+ encouraging comments, I feel compel to give the bookmarks to as many of you as possible as your comments are very encouraging and precious to me on how I may continue to serve our Lord through this blog! So God willing, I am going to give some bookmarks to each and everyone of you who have participated in my First Give-away last Wednesday. Yes! In other words, I am hoping to mail you between 6 to 2 bookmarks depending on your comments. But it will also mean I will take a while to make and post these bookmarks to you. And don't forget to leave a comment here too to let me know that you have emailed me. I will be in touch with you as soon as I can after that. I will let you know individually through email how many bookmarks you will be getting. To make this gift a more meaningful one to you, I will be giving you the liberty to choose your favorite bookmarks from my Homemade Bookmarks, Cards and Gifts website. So do email me if you do not mind waiting and really wish to own these bookmarks! ♥ I am thankful to God for the friendship that we can enjoy in Him because of what He had done for us and in us. In appreciation of your love in Christ and friendship, I want to share this very very encouraging video on the reunion of Christian the Lion and his 2 owners, and the wonderful lasting friendships between them. May God bless us in our friendships with our loved ones and brethren in the family of God, and our long distance friendship through blogging. Thank God that though we are separated by many mountains and seas, we can meet together before His throne of grace daily and walk together through our sharing on our blogs. Thanks again for all your visits and encouragements! All praise and glory be to God! Love knows no limits and true friendship lasts a lifetime. Thanks again for your visits, prayers and encouragements. Remember to take the Award with you and pass it on to your friends and email me if you want the bookmarks. I am thrilled to get my own Guest Book! Please sign my Guest Book if you can! It's on top, just before this post. Thanks to all of you who have signed my Guest Book! Thank you for stopping by. Hope you have a blessed day! I'm not Li-on Nancie...You are a prize!!! Blessings & much love with prayers...precious beloved flower of Singapore, Nancie...treasured child of the King of kings, how packed is this beautiful post of WFW & TT...with Award & give away results...can you add any more, even a beautiful song with a wonderful story! Your thankful list is overwhelming and filled with God's spirit! I Love the portion of scripture you shared from 1 John 5! I love the award that Jill blessed us with and you definitely are sowing seeds as a precious servant. Every one of your prayer of Thanks to our Lord shows us how you fill your mind with the Word of God & use it! I will continue to pray for your mom, sister, & 2 brothers & your wonderful business that you do bringing glory to God & provision from you gifts & freelance service! Make God continue to be faithful thru your church brethren. Praise God! You are a blessing to us & your blog blesses us with all you share plus your encouragement. sweet spirit of the Lord!! !Enjoy your WFW & TT! Keep the pace!!! What a great post. Thanks so much for sharing with all of us. Congratulations on the sweet award too! I started my Wednesday "more than you'll ever know" friend meme. Please stop over and check it out and grab the little button and share with a friend. You are so precious, love you my friend. Hi Sis, Thank you for the beautiful Award and for blessing us with your beautiful bookmarks. I will also email you too. I love your heart!!! Wanted to drop by and say hello. Have a great week. God Bless. Thank you so much for sharing the award with your friends! Your post and all that you put into them always lift me up! You are such a special and unique person - whom God loves so much that His light shines so brightly through every broken crack you have - which He keeps filling up! Thank you for the bookmarks. I look foward to receiving them. What a lovely gift I will cherish! You have my email address right? What a beautiful WFW (and TT!). Oh, may I love the way Jesus does. Oh, may others know me by my love! Congratulations on your award. What a wonderful WFW post. Sometimes it is quite a challenge to love others. You are such a precious sister in Christ. I always enjoy my visits to your blog. Blessings to you today! I appreciated you WFW verse. How powerful. We have no excuse for a lack of love, His great gift of love compells us. As usual, I love coming over here and visiting you as you never cease to give honor, glory and praise to our awesome, Sovereign and good God! And I LOVE that video! It's incredible what God can do to an animal that only lives by instinct! I'm also very grateful to hear how God has been providing for you financially as I continue to pray for you on this! Oh, what a blessing! I emailed you my address but forgot to say which one - Psalm 73:26. Thanks so much, and what a beautiful WFW and TT post! You are a blessing, my friend. Your sweetness never fails to touch my heart. What a great post. How I love your scripture for today and that beautiful photograph! Wow. Your thankful list just keeps the inspiration coming! Know that I'll be praying for you as a witness to your family. For many years, my husband was the only Christian in his family. 10 years after my husband was saved, his sister (also, ironically named Nancy!) became a believer and she is ON FIRE for God. They both are fervently praying (as am I, of course) for the rest of their family and living as salt & light before them. Galatians 6:9! Such a beautiful verse and one we all should always remember to follow. You are a great photographer as well Nancie! Great post! I was going to post a comment this morning, but my computer decided to come to a complete halt for some unknown reason. Are you serious? We all receive your lovely bookmarks?!?! That is just so wonderful and giving of you!! I love the video!! It made me cry and yet gives me great hope. This video reminded me that God always loves me and will never forget me. I forwarded it to several friends. I'll drop you an e-mail with my address. You are just too awesome!! And another award for you!! WOW!! Are we all supposed to share in this award with you? If so, I'll post it on my blog!! Nancie-What a wonderful post. Congratulations on the Faithful Servant Award. Jill is such a great friend and sister in the Lord. Praising God that He has brought all of us together in blogland and that together we can sow seeds of God's love and Truth. May God continue strengthening you, providing for each and every need and may you feel His presence in your life in a powerful way. Many blessings to you today. I loved your verse today. Thanks for sharing it. Thanks for coming over today and visiting me too. Good luck with all the bookmarks and getting them all sent out. That is such a sweet present. Thanks for sharing your Thankful list. Great words! Thanks for sharing! It is so awesome to read that you have such a strong Christian community around you that is helping you out so you can take the freelance work. Just beautiful!!!! Nancie, as always, you continue to bless me with each post! What a blessing you are to so many! Your generosity is precious. If anyone ever deserved the Faithful Servant Award...you certainly do! Have a wonderful week...thanks for sharing. Hi Nancie, what a lovely post! I love your combination of two in one. Congrats your sweet award! Dear Friends, Thanks for stopping by and for all your encouragements! So sorry that I am not able to visit most of you yet as I am rather swarmed with some family commitments and work. I hope to be back blogging soon and visit you then! Do remember to take the Award with you, post it on your blog and share with all your faithful friends. Do email me too so that I can post you the bookmarks. I will be in touch with you again. Dear Beth, thanks for your encouragements. Yes, I am sharing the Award with you and all my other blogging friends who are faithfully sowing the seed of Christ's love. So pass it on!